The CrossGrip is a small keychain multi-tool from SOG. When closed the tool is just 2 1/2 inches long. It features SOG's compound leverage coupled with two springs, so the pliers will keep springing back every time you use them. The pliers are a very particular design not seen in other tools, they work like a powerful lobster clip being a hybrid between needle nose pliers and regular pliers. They have a wire cutter that is quite strong and can also be used as a wire stripper. With the leverage system and the springs you can apply a lot of force to this small pliers and they will resist, we can say they are really excellent for their size. To access the tools you have to open the CrossGrip. In one of the hanldes it has tweezers, a flat style screwdriver and a small knife with a chisel style grind. These tools work very well, the screwdriver being strong enough for some light prying and scrapping jobs. The second handle features a nail file, bottle opener, eyeglass screwdriver and philips screwdriver. These tools are all very good except the philips screwdriver that is too small and the head is too round to be used effectively. Finally the tool also has a lanyard hole and a ruler. The CrossGrip offers a very particular set of pliers of excellent quality and a nice set of additional tools in a very small package, a very interesting option as a keychain multitool. 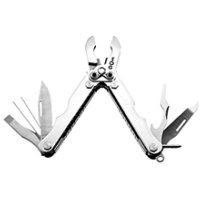 It has many similarities with the leatherman micra, changing the scissors for pliers in the SOG. You can read more at SOG's website and order for $28 from KnifeCenter.